And so we find ourselves in February 2016 already. The mueseum may not be running any trains until Easter, but during this quiet period the volunteers are looking back at what has been achieved in the previous year, while we get on with remedial track work ahead of the 2016 season. 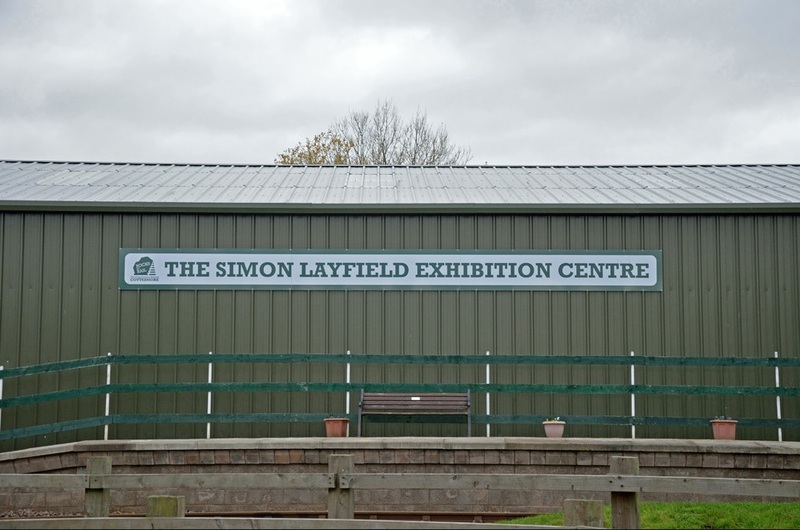 Without doubt, the highlight of the year was the opening in November of the Simon Layfield Exhibition Centre. 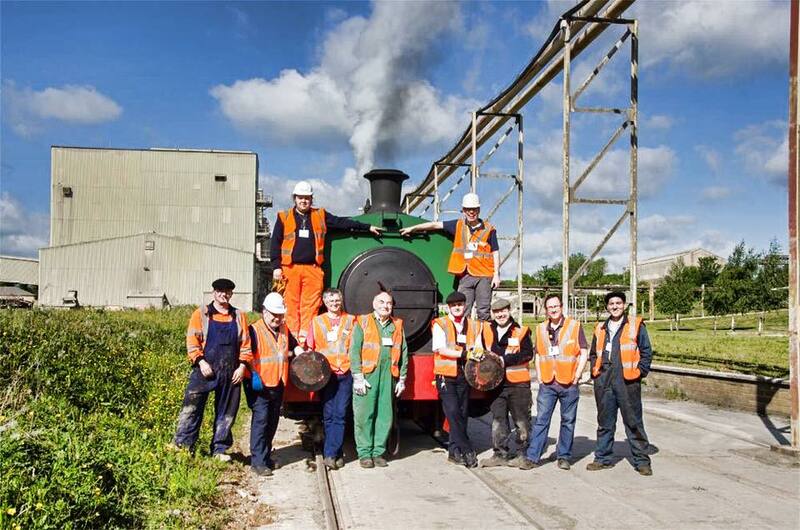 This three road building which now stands on the old Loco Yard is a most significant advance for the museum, and could not have been achieved without generous help from industry partners, and heroic efforts from our own volunteers. The Exhibition Centre has been dedicated to the late Simon Layfield, whose hard work and vision helped shape Rocks By Rail into what it is today. We can not rest on our laurels though, and track work has already commenced on the point work that controls access from the main running line into the eastern head shunt. there is much to be done. 2016 will see a concerted effort to recruit new volunteers, these are the lifeblood of any such museum, and like anywhere else, we could always use more. We always need help either staffing the cafe, undertaking engineering and restoration work on our exhibits, keeping the grounds in good order, or working along the track. The heritage railway and museum worlds offer wonderful opportunities for learning, meeting people, contributing to exciting projects, and being part of a fantastic team united through common interests and purpose. If you fancied coming to try your hand volunteering with us, why not come along and join up on a Tuesday or Thursday (note – working volunteers must join as a member, and some age restrictions may apply). The website has now been updated with details of events for 2016, we do hope you can come and join us. We will also be offering ‘Driver For A Fiver’ on Sunday 14th February – why not treat the lady in your life to a trip in one of our historic Rolls Royce powered diesels this Valentines day! What could be more romantic? We are now almost set for our Spring Gala With A Stanton Theme. 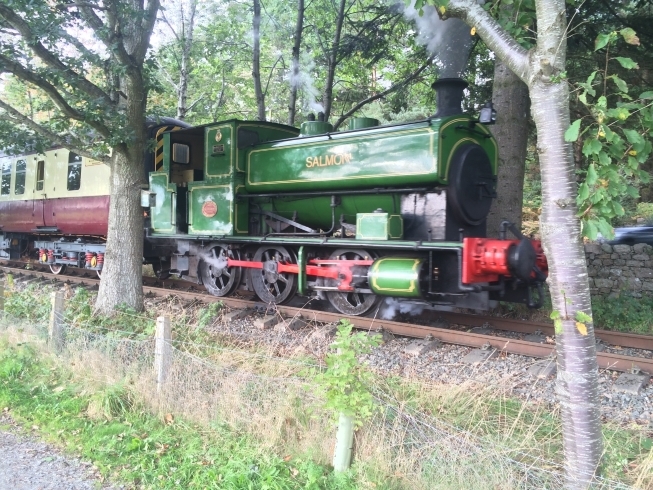 Though SALMON needs a bit of attention for known issues, she has already been in steam at Rocks. The occasion was our very first DIG IT driver experience day. Both SALMON and the two participants did sterling work throughout the day, which made for a momentous occasion for participants and volunteers alike. In fact, expressions like ‘Crazily Awesome’ were used! 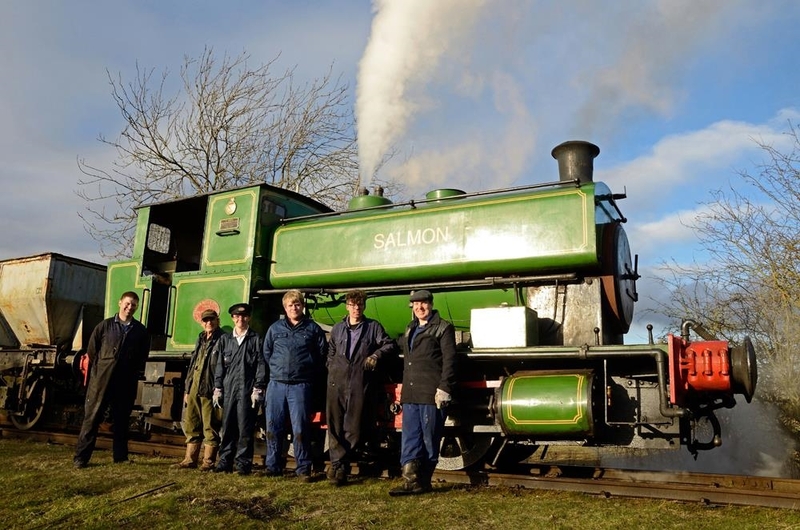 Some final and minor issues are still to be worked on, but SALMON really is set to be star of the show at the gala on the 15th March, when she will once again work iron ore stock, running past her sister loco, BELVOIR, and the Woolsthorpe shed. Work continues on the IREC building, and this week has seen a press release by the museum, acknowledging the tremendous help with donated materials from both LAFARGE/TARMAC, and HANSON. 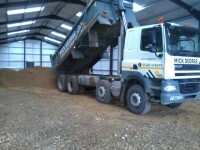 The materials in question were 40tonnes of granite chippings and 20tonnes of cement and aggregates respectively. This is a huge help for a mammoth project, and the museum is grateful. This keeps us right on track for completion of the IREC project, which will open later in the season. 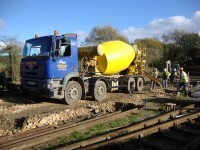 Work to start laying track into the shed will begin in April. Currently, the doors are being fitted, and the block work is being finished. A press release made earlier in the week can be read HERE. All Set For 2015 – Well, Very Nearly. Here we are in January already – we hope all our blog followers are in good form. Lots of things were going on at the museum yesterday, despite not being an advertised running day. 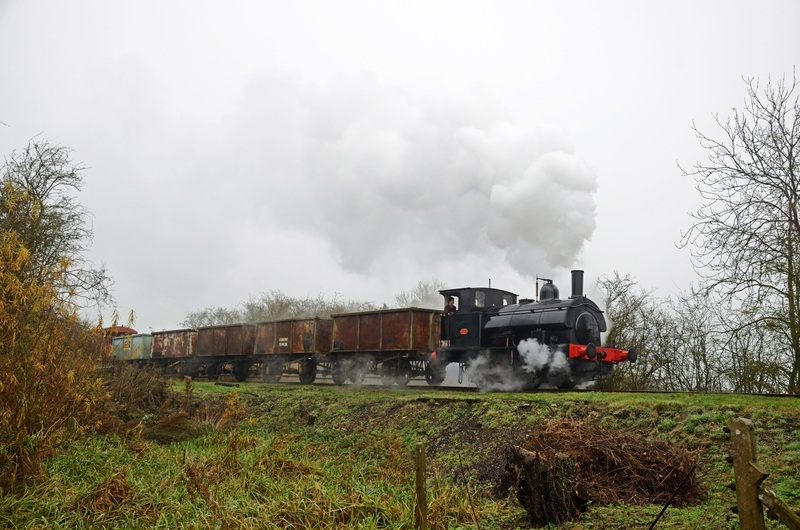 Two locos were prepared for use, AB2088 SIR THOMAS ROYDEN, and Sentinel 10204 JEAN – the purpose being to formulate a new quarry operating routine, utilising the new quarry spur to carry out a wagon exchange. This also gave us the opportunity to get some of the newer volunteers onto the quarry floor to try their hand at signalling, coupling, pinning down wagons, and point throwing for shunting operations. And so it was, that JEAN shunted a set of Tipplers between the quarry face and the quarry spur, later joined by SIR TOMMY with a set of hoppers and a brake van. The necessary shunting moves were then carried out and timed. We are happy to report that all went very smoothly. We are sure you will agree that this will make operations even more interesting – just think of the combinations – hoppers going out and the Metro Cammell dump cars coming in, to then be exchanged for hoppers. Then imagin what this operation will become once the development plan is fully realised, with the North End exchange sidings and a passing loop in place! This website is due for an update, and we are told this is likely to happen sometime this week. The updated version will have pages added showing a map of the site as it is, and with the proposed developments added. There will also be a page dedicated to DIG IT, our driver experience package. Watch this space. We cant possibly finish without mention of the IREC building. There willbe a big push on getting the block work started later in the month, and we are given to understand that the doors are not too far away. The rate of progress on this project has been remarkable. Dont forget that Sunday the 1st February is a chance to be a Driver For A Fiver in one of our diesel locos, and that our next running day is 15th February. With AB1931 out for scheduled maintenace, this will be mixed traction running. Just one more thing, if you use Facebook, you can keep up with us through our group page HERE. Until next time…. The Years End, But We’re Back Sooner Than You Might Think! …And so the last Santa trains have been run. We would like to thank each and every one of our visitors this year for helping make this a very successful year overall. We have made some great gains this year, not least with the Exhibition Centre well on its way, and the Sundew project continuing quietly in the background. We have met some wonderful new members, welcomed new volunteers, had some fantastic press coverage locally and in the railway glossies. We have new track down in the quarry section, and plans afoot for the next stage of the development plan. We stop for a short pause over Christmas, and wish all our followers a hearty HAPPY CHRISTMAS AND NEW YEAR! If you find yoursel full of turkey and fed up of TV repeats, you can always browse issue 3 of IRONSTONE from this link, or view a Youtube photographic montage of Rocks in 2014. 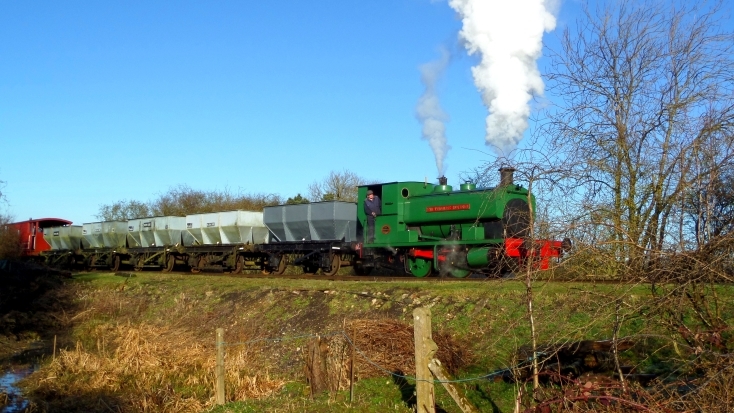 We are back in action on New Years Day, so if you’re feeling jaded and need to blow the cobwebs away, or you just feel like a day of industrial heritage, come and join us – no need to book as the Christmas Trains leaflet stated, we have enough capacity, so just come as you are. New Years Day will be the only running day in January as we need to allow time for remedial track work in the area of P1, the points that lead in to the platform. Other work over this period will see a big push on the Sundew Cafe revamp. Our 2015 Visitor Guide is now available here, and we hope you agree that it looks like another good year. We very much hope to see you. Rocks By Rail is ending its year on a high! The weekend of 15th/16th November was one the volunteers and visitors wont forget for some time. Beyer Peacock No.1827 visited from Foxfield, and took part in a rather misty photo charter on Saturday alongside both Barclays resident at the museum. The weather did not dampen the mood, in fact it provided some very atmospheric shots. The shutters kept clicking until well after dark. Sunday, of course, was gala day, and another misty start didn’t deter anyone – the site was full to capacity by late morning. All three locomotives performed admirably, and each took a turn on passenger duty, quarry shunting, and main line tippler runs. Visitors cam from far and wide – almost all the industrial railways were represented. Visitors were still arriving even when the heavens opened in the mid-afternoon. Thank you to everybody who came. If you didn’t make it this time, you can enjoy the photographic record, courtesy of Alistair Grieve, just click here. We are now just a few weeks away from the Santa trains, which will be on the 14th and 21st December, and then there will be the Mince Pie Specials on New Years Day. Tickets must be pre-booked, and are on sale now. Click for details. A lot of maintenance and development work will be taking placeover the winter months, the main project being the Ironstone Railway Exhibition Centre currently being constructed on the site of the loco yard. We will keep you up to date with all goings on through this blog, and also through our Facebook Page. First Concrete Poured For IREC! 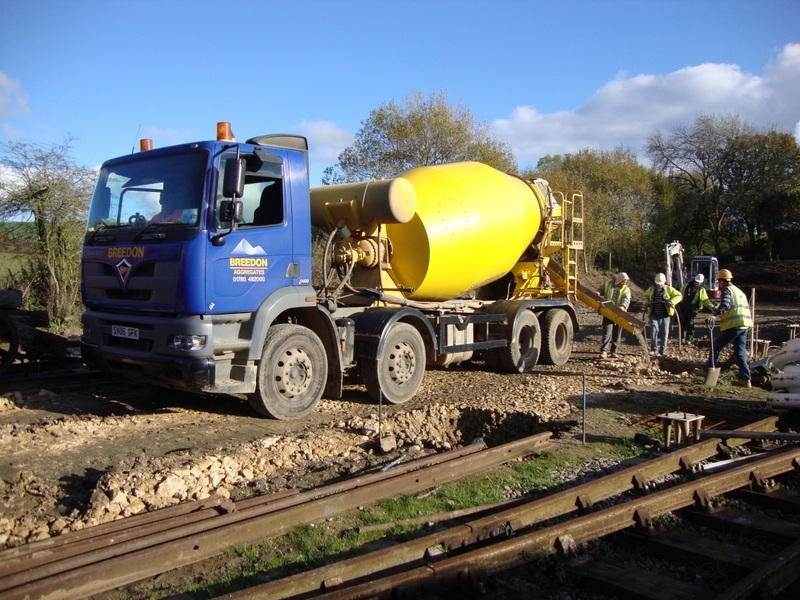 We are happy to report that the first concrete has been poured for the Ironstone Railway Exhibition Centre. This mixer truck arrived on site yesterday to supply concrete to fix the anchor points for the vertical members. Things are really coming on apace with this project, and you can keep right up to date with it on our Facebook Page. This project will transform the site for both volunteers and visitors. It will provide greater security for our collection, and allow preservation and restoration work to progress unhindered by the weather. Importantly, visitors can browse through the exhibits without being subject the numbing Cottesmore cold, or anything the British weather can throw at us. In other news, we have just heard that this years Autumn Steam Gala visitor, VULCAN will be touching down at Rocks By Rail on Monday. Dont forget that the gala will be on Sunday the 16th of November. We all look forward to welcoming her and her crew to Cottesmore – and seeing her work up the gradient! Other work on site has seen further progress on the Quarry Spur, which now has the first few panels bolted down, and the curve has been set, this project will be finished in time for the gala – giving more scope for shunting in the quarry , which will be good for the railway operationally, and interesting for the visitors watching from the quarry viewing area which will be extended to the length of the quarry. Just one more reminder for our followers, there are still places available on the Santa trains on the 14th and 21st of December. There is also space available on the Mince Pie Special on New Years Day – what a way to start your year! Booking is essential, and you can secure your place by calling 07873 721941. In the last blog post, we were pleased to announce the grant awarded by Mick George and Grantscape. Well, this project has launched in a massive way, with a 73 move shunt to clear the Loco Yard and a gargantuan effort to clear the rail and sleepers in order that ground work for the new three road shed, The Ironstone Railway Exhibition Centre, can begin. So take a good look at the panoramic photo of the yard above, because very so this will be transformed! The benefits of this project are massive – with year round viewing for visitors in all weathers, and much better conditions to restore the exhibits. The good news doesn’t end there on the grant front. Since our last update we have also been awarded £8,100 by the Heritage Lottery Fund to restore the cab of the massive drag line excavator, Sundew. Work has already begun, and the top priority is to get the cab weather tight. There will be a lot more on this project in due course. Father Christmas comes to Cottesmore early this December in order to act as Station Master on the 14th and 21st. If you would like to join him on the North Pole Express, or to enjoy a ride on the Mince Pie Special on the 1st January 2015, then booking is essential – so call our hotline on 07873 721941 and see the flyer here.